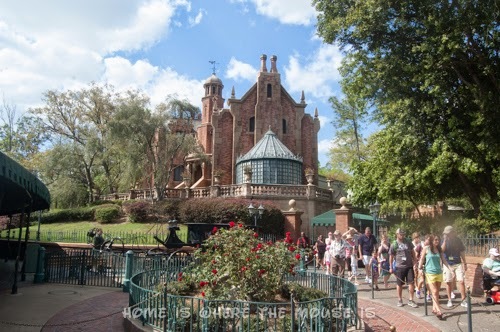 There’s nothing like the anticipation of entering The Haunted Mansion. You can see it from a distance, and as you get closer, more and more details start to become noticeable. From sound effects, to lighting, and eerie elements like the cemetery, Disney sets the scene before you even get inside. For our Haunted Mansion party, we want to give our guests a taste of that experience. 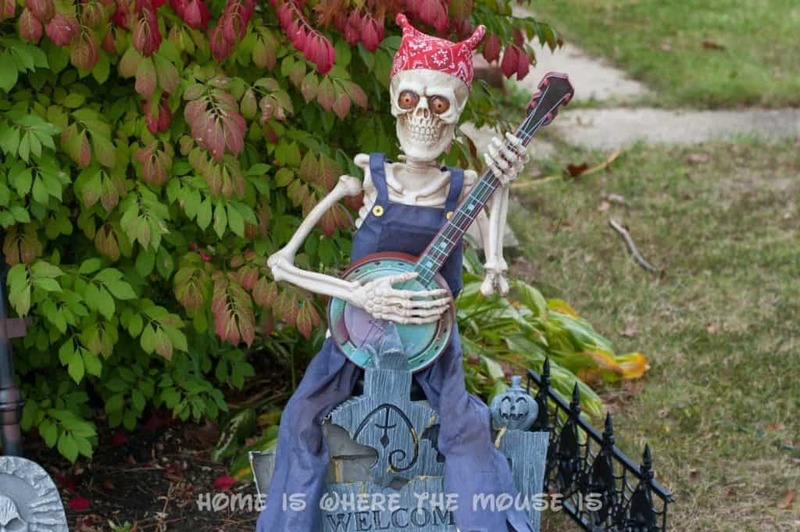 We don’t live in a mansion, but by borrowing a few tricks out of Disney’s book, we can help give our house that air of foreboding as our guests approach. 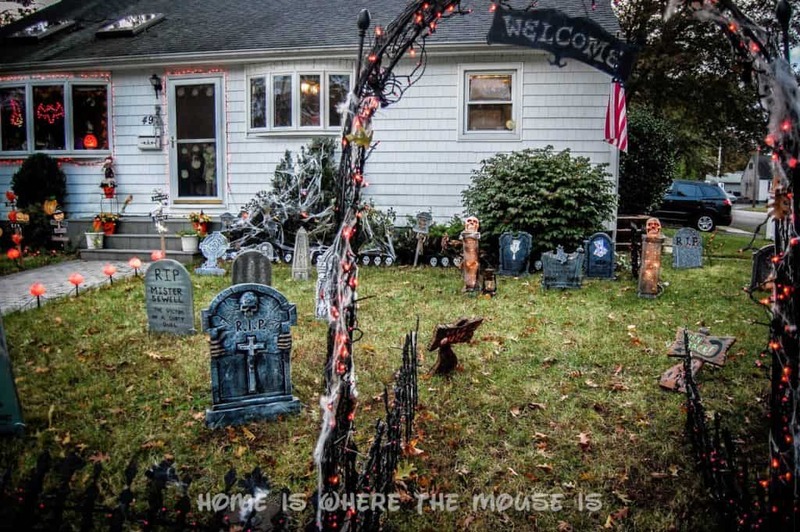 Each year, we decorate our house for Halloween, including our very own “spooky graveyard”, as our kids like to call it. So we have some of the props we need on hand already. At the very least, you’ll need some tombstones. Many stores sell a variety of Styrofoam tombstones that look very cool. One of the big problems I have with these, however, is that they are so light that they get blown away during the October storms we usually get around here. So, eventually I got frustrated with the Styrofoam tombstones and started making my own out of wood. I like making my own because I can customize them however I want. 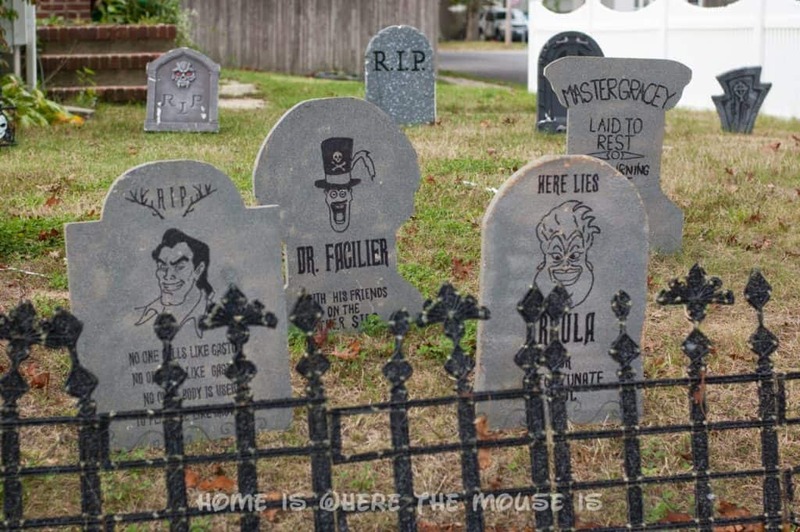 You can see how I made my Gaston Tombstone for my Disney Villains section of our graveyard. Right now, our graveyard is a mixture of store-bought stones and homemade ones. 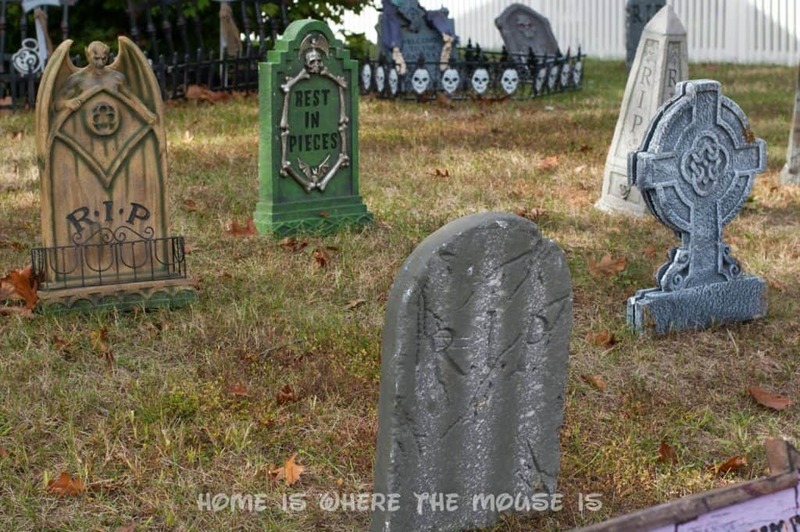 I even had a couple of official Disney Haunted Mansion tombstones, but they were broken soon after I bought them when someone vandalized my display. 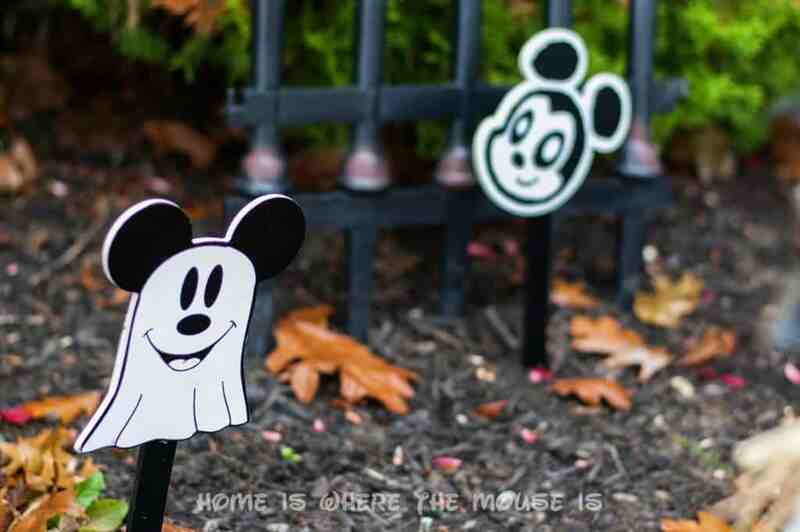 If you’re just putting up your decor for the night of the party, then you can certainly get away with using tombstones cut out of cardboard, painting them and writing/drawing on them. Other touches to consider adding are a fence and cobwebs. Fencing can be good for keeping people from getting too close to things you don’t want them to touch. Cobwebs are cheap and can help give things the appearance of being old and unused. 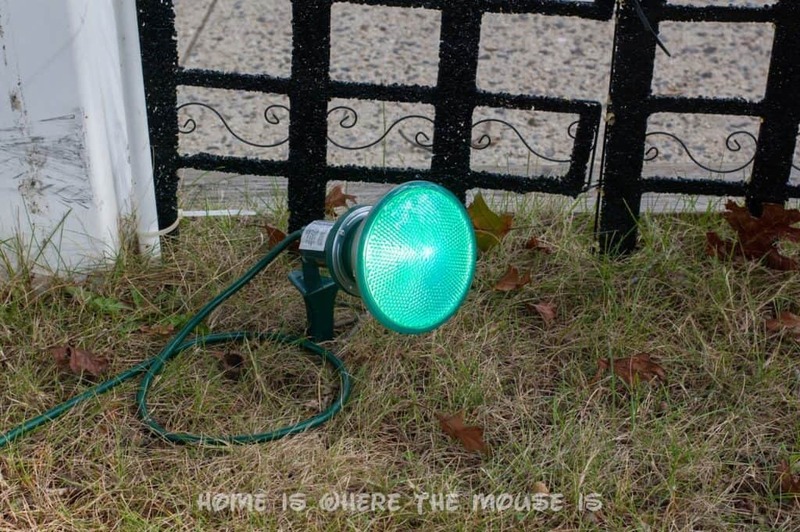 If you want your decorations to be seen at night, you’ve got to add some light. Colored floodlights are great for this. I have two green floods casting an eerie light upon my display. I’ve been trying to switch to LED lights, not just for energy efficiency, but also for safety as the normal flood lights can get quite hot. Flickering candle lights can also be a cool touch, as well as glow sticks, especially for only one night. While certainly not entirely necessary, adding some special effects can really take your decorations to the next level. The simplest idea is to add some creepy music and sound effects. There are many CDs out there you can buy/download, and then you just need a device to play it from. Adding fog to a cemetery is always a hit. It can be tricky though. Fog machines aren’t cheap, and the fog tends to rise up and get blown around by the wind. There are some DIY ideas around on the Internet for making “fog chillers” to help your fog stay low to the ground. Dry Ice is another option for creating a low lying fog, but it can be costly and requires supervision. Last, but not least, is adding animated props. There are plenty of continuously moving props or motion-activated props you can buy if your budget allows. There are also plenty of creative ways to use household objects you may already have to create an effect. Keep it fun and inviting. Remember, you’ve got more in store for your guests inside the party, so you don’t want to scare them away. If you want your guests to walk through your display to get a better look, then be sure to use signs to let them know. You could block any other path to your door to make certain they do, but I prefer to give my guests the option of which way to choose.